The Converse Blog: 'S Friday Flashback: Converse ECO shoes. If you couldn't figure out, the whole Dwyane Wade to wear chucks was a very bad attempt at a April Fools joke. Oh well maybe I fooled one or two you out there. Now onto the Friday Flashback. 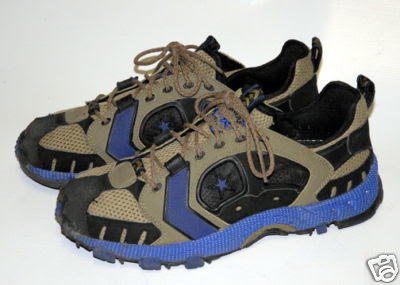 A few years ago Converse had a line of trail shoes going by the name of Converse ECO. I actually had a pair of these in a different colorway. These shoes were build tough, and wore them while helping to build an outdoor classroom in my high school biology class. In fact I would still probably be able to wear them had I not been an idiot and tried to put them on while they were still tied. I know we all do it, but we really shouldn't. I messed up the heel cap and now sometime sharp sticks out and attacks my heel. Oh well, I am still holding out hope to find a pair on the eBay someday. Well that's it for today, I am off on spring break next week but I'll try my best to post something. Thanks for checking out the blog! Enjoy the Final Four.